Tackling homelessness and addressing housing need is a high priority for United Ways and Centraides across Canada. In collaboration with a wide range of allies and experts, we have developed a set of innovative and fact-based policy solutions. There is a growing consensus that Canada must do more to address poverty and social exclusion. Former Parliamentary Budget Officer Kevin Page, among others, are actively advising governments to invest and introduce solutions to homelessness and inequity as a matter of good social, and smart economic policy. The following joint letter urges the Federal Minister of Families, Children and Social Development to include a new Portable Housing Benefit as part of the National Housing Strategy. This benefit will provide direct financial help for people who are homeless and tenants in the greatest need. 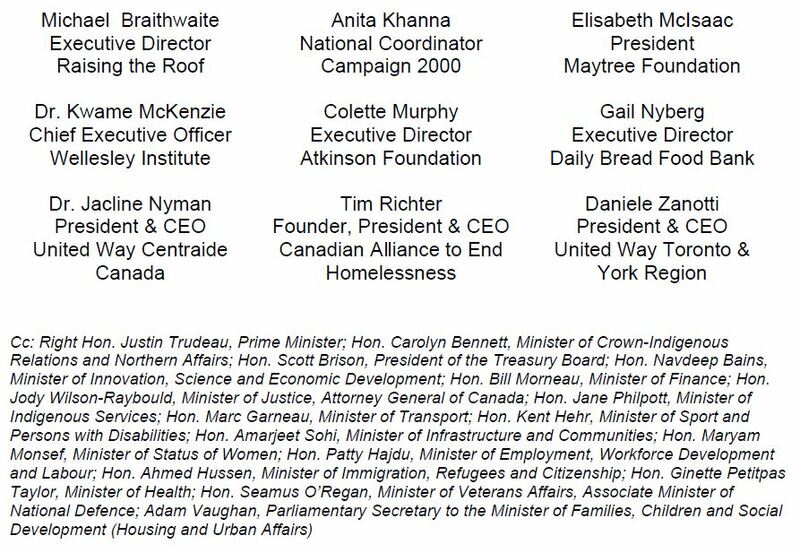 As leading organizations in the fight against poverty and homelessness in Canada, we are writing to urge that your government take action on a new National Housing Benefit that can effectively address the immediate and growing gap between household budgets and the basic cost of rent. A new portable housing benefit would be a historic next step in Canada’s efforts towards greater fairness and opportunity for all Canadians. In his November 2015 mandate letter, the Prime Minister charged you with leading a first-ever federal poverty reduction strategy for Canada. One of the first major investments of your government, the Canada Child Benefit, is already lifting tens of thousands of households out of poverty just two years into implementation. The ten-year renewal of the Homelessness Partnering Strategy promises to significantly reduce the trauma of homelessness in this country. And a National Housing Strategy, expected this fall, will further advance the goals of fairness and opportunity. Now is the time for the government to build on the fight against poverty. Today, more than 1.5-million households in our country are struggling to afford their housing. Rising income inequality, a challenging labour market and scarcity of rental housing stock people can afford, has created a crisis that makes too many families vulnerable. Investing in new affordable housing and ensuring that we revitalize existing stock are essential to solving this problem. But supply-side measures alone will not be enough. Direct assistance to renters is the most immediate and effective way to meet your government’s goals of diminishing homelessness and alleviating core housing need. Rent is the single biggest expense for Canadian households living with low incomes. Direct assistance for renters would help households most in need, complement social housing, and provide a flexible benefit that renters can use regardless of where they live in Canada — all without adding pressure to the already-heated rental market that exists in some Canadian cities. We are calling on your government to work with the provinces and territories to launch a national portable housing benefit that starts by assisting those with greatest need, particularly households currently spending more than 50% of their incomes on housing and Canadians experiencing homelessness. To address your 10-year goal of tackling core housing need, this support should be expanded to provide coverage to other vulnerable households. A national, portable housing benefit would have a real, meaningful impact on the lives of thousands of Canadian households by giving them choice and the means to afford rent. The benefit should become a mutual cornerstone of the National Housing Strategy and Canada’s Poverty Reduction Strategy. Aligned with other investments, a portable housing benefit will set Canada on track to eliminate deep core housing need and lift tens of thousands of households out of poverty. Thank you for the time, attention and compassion that you and your colleagues have brought to this priority issue for Canadians.